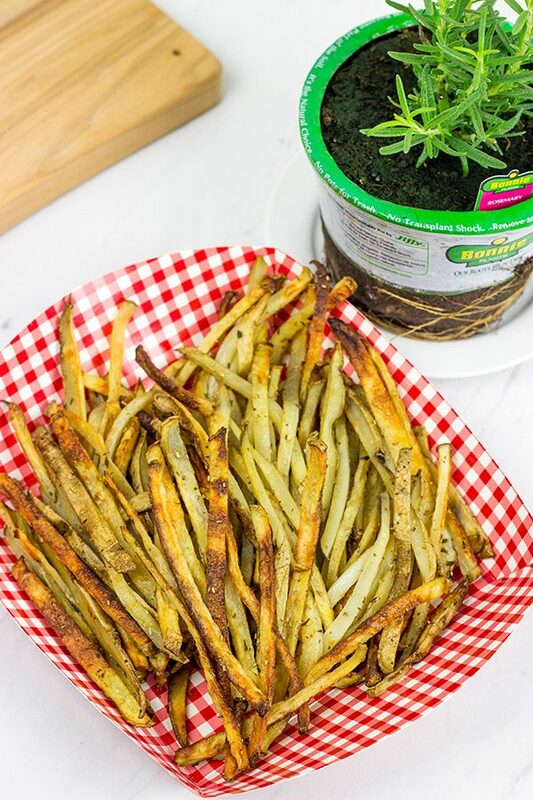 Thin-cut fries seasoned with fresh rosemary and garlic, these Rosemary Garlic Smashfries will become a favorite in your house! I love a good hamburger. Correction. I love a good cheeseburger. I’ll often order a burger whenever we go out to eat, and my wife routinely makes fun of me for this. But you know what? I’m ok with it. Her philosophy: When you go out to eat, order something that you normally wouldn’t make at home. My philosophy: When you go out to eat, order something delicious. Several months ago, Smashburger finally opened a location in our area. Conveniently, it’s less than a mile from the curling club. So one night after a game, our team piled into the car and made the long trek over to Smashburger. We played the early game from 6:30-8:30pm that night, and most of us don’t eat dinner before the early game. Needless to say, we were hungry. And we ordered burgers and fries all around. So I enjoyed my Smashburger experience. Was it the best burger I’ve ever eaten? No. But it was good. However, what caught my attention were the Smashfries. 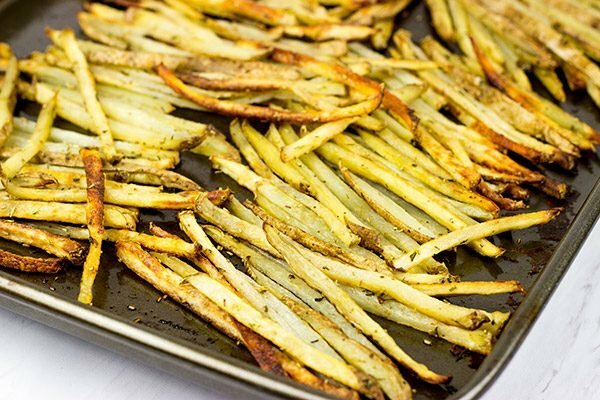 Thin-cut fries tossed with olive oil, rosemary and garlic. I was hooked! I’m not one to order a burger and fries and then talk about the fries…but these Smashfries were legit. 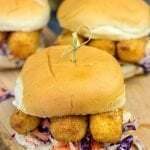 I decided that I needed to figure out how to make these bad boys at home. These Rosemary Garlic Smashfries are the result of several attempts to recreate fries that mimicked the real deal. And I gotta say that they’re pretty darned delicious! (Trust me, I ate quite a few of these as I was taking the photos.) But here’s the thing. I toyed with the recipe a bit to create a baked version of these fries. I love the spring and summer for so many reasons, not the least of which is the fact that fresh herbs are readily available at the store. I know I can buy overpriced fresh herbs in the winter, and sometimes I do. But I usually opt for the cheaper dried version. However in the spring/summer, I turn to one of my favorite kitchen hacks: fresh herbs from the garden store. Skip the fresh herbs from the grocery store and go straight to the garden section. Or swing by a home improvement store. The potted herb plants that are ready for the garden are often cheaper than the herbs in the grocery section…and you can plant the leftovers once you’re done. So for these Rosemary Garlic Smashfries, I grabbed a pot of fresh rosemary from a home improvement store. I chopped off a few sprigs to make this recipe, and then I planted the rest in a pot. (I would have planted it straight in the garden, but I wanted to be able to bring that pot indoors once it starts to cool off up here.) Enjoy! What are your favorite kitchen hacks? Spray a baking sheet with non-stick baking spray; set aside. 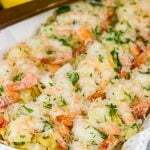 Slice potato lengthwise into ¼” slices. 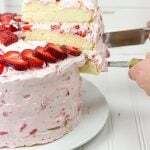 Lay each slice flat and slice into ¼” strips. After slicing, rinse potatoes in cold water. Pat fries lightly with paper towel to remove excess water. 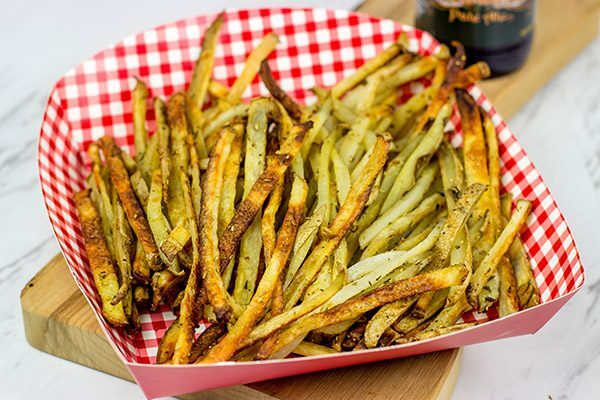 Place fries, oil and seasonings in a large plastic bag; shake until fries are well coated. 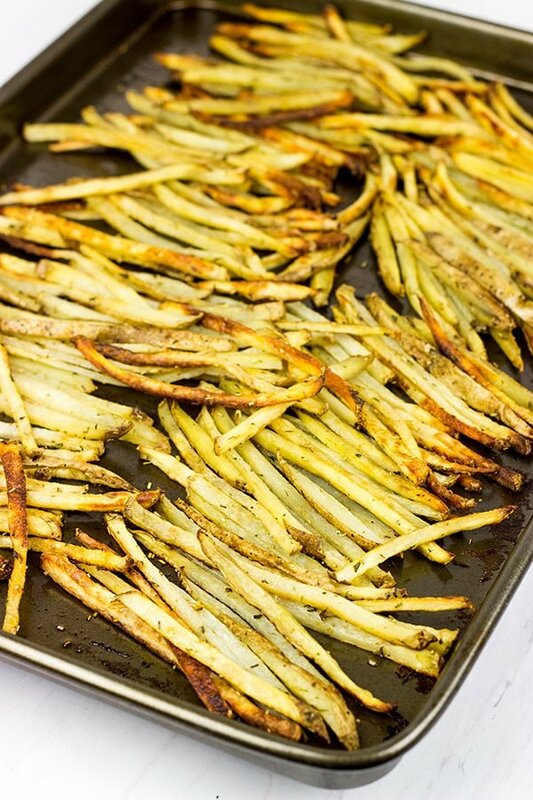 Arrange fries in a single layer on prepared baking sheet. Bake for 24-30 minutes, or until edges of the fries turn golden brown. Depending on the size of your potatoes, you may need to cut the oil, rosemary, salt and garlic back. I found these proportions worked well for the size of potatoes that I used, though. Hi David! I love the flavors you’ve got going on here and the fact they are “oven fried”. I always plant my rosemary in a pot for the very same reason as you (just be sure the pot has drainage holes). 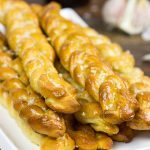 These would be a great snack on their own and so much better for the waist because they are not fried! Haha…yeah, I learned the lesson about holes in the pot the hard way. I brought our rosemary in last Fall and it made it a little while…but then it turned into a rosemary cactus. Still smelled amazing, but I’m thinking the dead branches might not have been the best texture. 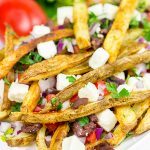 🙂 These baked fries were a fun side dish…in fact, I kinda wanted to just eat the whole tray as a main dish! Lil Shashi would so agree with you – her mantra when we go out is always order something that is delicious – not a novelty – like what I usually do! How convenient that Smashburger opened up so close to your curling club! And how brilliant to use potted herbs in dishes! GAH – I’m sitting her shaking my head at all the money I’ve spent on “fresh” store bought herbs – when I could have gotten truly fresh potted herbs! BRILLIANT kitchen hack! 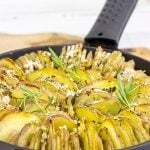 I so love the combo of potatoes and rosemary – now I gotta try these thin, baked “smashfries”! Why am I not surprised at this one? I think lil Shashi and I have similar tastes. I mean after all, we did order the same thing for lunch the other day! 🙂 These fries are definitely a must-bake…put ’em on the list! The only annoying part is sitting there slicing the potatoes into little shoestrings. But it’s worth the effort! Also, I’m right there with ya on the herbs thing. I love when spring rolls around because I can get my herbs at the garden center instead of paying 2x or 3x as much (for less!) in the grocery store. I love making my own baked fries at home. I am going to have to try this garlic, rosemary version. I’m usually just add salt type of gal. Time for me to step up my fry game! Oh, there is nothing wrong with a simple salted fry! But these rosemary garlic ones were super delicious, too. Definitely put ’em on the list, Kathy! My philosophy about eating out: order something you won’t normally make at home. However, practically 80% of the time I end up ordering something familiar and what I can easily make by myself. I don’t know why. Perhaps, that gives me kind of satisfaction to realize that I would have make this particular dish much better. Anyways, these potatoes look and sound delicious (And what a fun name!) 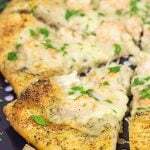 The combo of rosemary and garlic is always a good idea! Yeah, I understand that philosophy. I do. But I always understand the philosophy that I want something comforting and delicious when I go out. And if it’s new, then I might not like it…and then I’d be sad. And yes, I totally agree with you. We often go out to eat and then end up thinking “hey, we can make this at home…and better!” But part of the fun of going out to eat is not having to cook and clean up, ya know? Definitely give these fries a shot, Ben…they’re super tasty! When I go out to eat I always tell myself that I am going to try something different, but it never happens. I usually end up ordering the same old things. When I saw your post I was like wow, I was just talking to my daughter about making fries similar to your recipe. Funny. Your fries look yummy. I love fries and I would probably eat the whole plate full of these fries. This is flavor heaven, I love rosemary and garlic. I would be very hard for me not to eat them all myself. I could make a meal out of fries. I always try to order something that I wouldn’t have at home, but I am a creature of habit mostly. I try to order something that I know the restaurant could make better than I could though haha. Rosemary and garlic on potatoes is the way forward, so I am totally on board with these fries. That is true, Dannii! Don’t go to a Chinese restaurant and order chicken parm. (Yes, the Chinese restaurants near us offer chicken parm. No, I’ve never been brave enough to order it. Haha!) These fries are epicly delicious, though! Hope you and Dave have an awesome fry-filled weekend! These look phenomenal! I’m also impressed at how evenly you cut the fries – I thought you’d used some sort of machine. We’ve got tons of rosemary growing in the garden right now, so I can’t wait to try these…just as soon as it cools down enough outside so that I can bear to turn on the oven! Hah! Cutting those fries was a bit of a task, but I just turned on my 80’s station and Pandora and got to slicing. It wasn’t that bad in the end…and so totally worth it once these fries were done! Yes, use some of that rosemary for these fries!! Oh wow cutting those potatoes would have taken a heck lot of time but looks like it was totally worth it! I can never resist fries, even better when baked! These sound delicious David! Favorite kitchen hack is totally to buy frozen french fries. Just kidding! So, I wasn’t too impressed by Smashburger too (I think Shake Shack had stolen my heart earlier). I’m kicking myself for not trying the fries!!! I’ll have to give this a go! I love Laura’s train of thought though- I try to eat something different out, unlike some people *cough* Niki who gets the exact same thing dependant on cuisine. Italian? Penne Rigatoni Bolognese. Japanese? Gyu Don. HAHAHA! Thanks for that hack, mate. You’re epicly helpful. Rosemary fries?? Sounds amazing and I love that they are baked. Also…my philosophy aligns with your wife 🙂 Order something you won’t normally get at home! But my husband is just like you. I could easily mack on these bad boys smothered with some gravy of sorts. Kind of defeats the healthier baked version here you did, but then again I wouldn’t feel so guilty. Gravy? That would be delicious…but totally not needed! These fries are packed with flavor straight-up. Trust me. I ate quite a few while taking these photos! Coffee and fries? I love a good cup of coffee, but I might have to go with something cold here…it’s been pretty hot here lately. Thanks, Puja! Love the look of these, and the flavour combo. Perfect compliment for a burger! I make homemade fries at home sometimes, but I’ve never used rosemary for them. Sounds like a good idea to me! 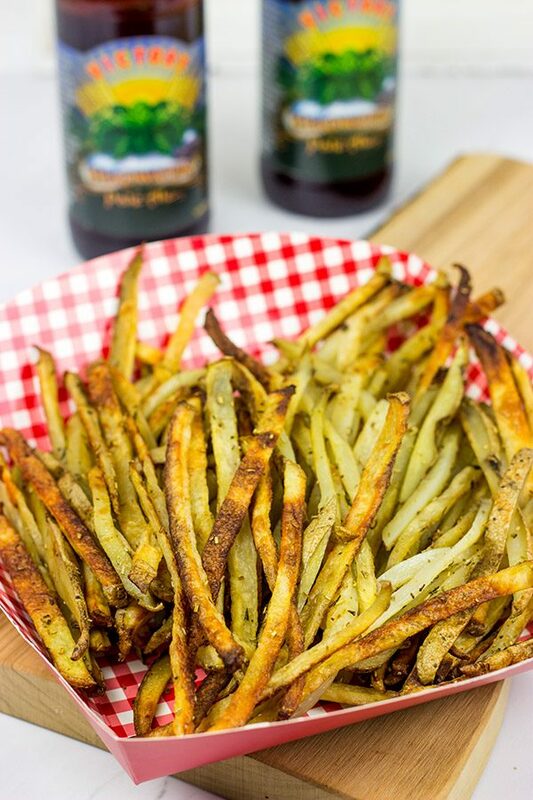 Totally add some rosemary in there next time, Nicole…it’s awesome on fries! 🙂 Hope you had a great weekend!